Disclosure: We are compensated for our reviews. If you click through the links on this page and make a purchase, then we receive commission and/or financial benefit. This is how we keep the content on this site free and pay for the products that are reviewed on this site. Digest Gold by Enzymedica contains a decent blend of Protease and Cellulase, two digestive enzymes that are critical for real results. It's not as potent as other products on the market, and it doesn't include any probiotic strains, so its effectiveness is diminished. However, it does clearly list its ingredients on its label, which is more than most digestive enzyme supplements can say. Another benefit of Digest Gold is its purity. It contains absolutely no fillers or additives, and it's dairy free. It comes in a 100% vegetarian capsule, so users don't have to worry about any side effects that come with harsh gelatin capsules. As far as purity and safety goes, Digest Gold's ingredients are near the top of its class. Digest Gold has many positive reviews regarding the product’s effectiveness, but one major complaint we noticed from users was the product's constant price jumps. This makes it difficult to continually take their digestive enzyme over the long run. Enzymedica offers their users a complete, 100% money-back guarantee within 30 days of purchase. While their return policy is better than most, its terms aren't as long as we'd like them. 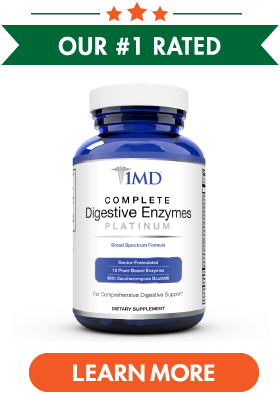 It definitely doesn't compare to a few other similar digestive enzyme supplements. 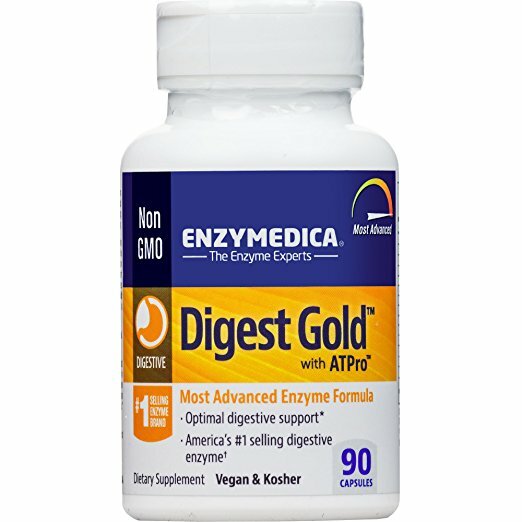 Digest Gold by Enzymedica is an extremely popular digestive enzyme supplement, and while it does contain a decently potent serving of enzymes, we were concerned about their limited return policy. Customers do love the product, however, so we rate it more highly than other digestive enzyme supplements. For more information or to purchase this product visit their website. P.S. While 1MD is the best candida supplement we've found, we would still love to hear about any other products you've tried. If you've had a great experience of your own, please send an email to Beverly@ConsumersSurvey.org with details. Information provided on this site is for reference only and has not been evaluated or approved by the FDA. Vitamins and food supplements are not pharmaceuticals and as such are not prescribed by a physician or a licensed health care provider. They are not meant to diagnose, prevent, treat, or cure any disease. If you are pregnant, nursing, have a medical condition, or are taking prescriptions and herbs, please consult with your physician before taking any supplements or adding any supplement to your diet. User reviews on this site are for educational purposes and reference only. User testimonials are collected from individuals who express their own subjective opinions on the product(s) listed on this site. Consumers Survey does not guarantee the claims made by individuals on the quality of any of the products described and/or illustrated on this site. Individual results vary from one person to another. User assumes all risks and responsibilities. The content on this site is accurate at the time of publishing but is subject to alterations at any time. Please check back frequently for updates. Consumers Survey should not be held liable any typographical errors and/or outdated information. This website is not intended for children under the age of eighteen. By using this site, you agree to abide by our terms of service.